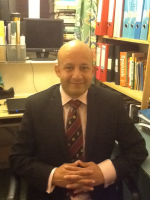 Mr Gupta graduated from the Royal Free Hospital School of Medicine of the University of London in 1992. Following house and casualty posts, he entered the Basic Surgical rotation at St Bartholomew’s Hospital in London, working at Great Ormond Street, the Royal London and St Bartholomew’s Hospitals. After passing the primary FRCS examinations, he undertook specialist surgical training on the Cambridge rotation, passing the intercollegiate speciality board examinations whilst working as a Senior Surgical Registrar at Addenbrookes Hospital, Cambridge. During this time he spent a year working as a Surgical Fellow in Perth, Western Australia, where he specialised in the treatment of major surgical trauma. His main interests include Colorectal Cancer, Inflammatory bowel disease, Colonoscopy, Bowel Cancer Screening, Hernia Surgery, Ano-rectal surgery and procedures for Pilonidal Sinus.